Kidderminster Harriers have signed the 26-year-old former Tamworth defender Michael Briscoe. Harriers manager Steve Burr said: "I tried to sign him when I was Stalybridge and Northwich but as a Birmingham lad location was a problem. "Obviously that is not the case for us here and I am really pleased about that as this is a good solid signing." 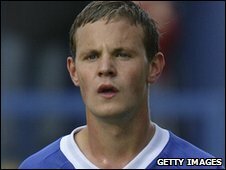 After a spell with Coventry City as a youngster Briscoe Joined Macclesfield Town for a two-year spell. He went on loan at Burton Albion before opting for a switch to Hucknall Town. Impressive performances both there and out on loan at Tamworth saw the Lambs swoop for his signature permanently for the first time in 2007. After spells at Halesowen and Redditch United he rejoined Tamworth for a second spell last year and made more than 40 appearances in the Blue Square Premier last season.